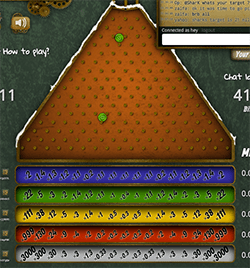 In front of you is a Plinko board with 17 win multiplayers at the bottom. You send Bitcoins to the bet address, and then a coin drops on the website indicating your bet. Whatever payout your coin lands on is the multiplier you receive back. For each level it drops, there is a 50/50 chance of your token moving one spot to the left or one spot to the right. Because odds show that more often than not there will be an close-to-even amount of horizontal movements, the bigger payouts are on the sides while the smaller ones remain in the middle. Payouts are sent instantly, almost always within a minute of making the bet. As of recent updates, Luckyb.it now has 5 different addresses or “levels” to play on: blue, green yellow, red, and grey, the promotional line. Each betting line has different payouts in each spot. From the top blue line, the odds of losing are slim, but the payouts are also tiny. The next line, green, has slightly bigger payouts, but also carries a higher risk of losing. Yellow is more riskier than green, and red is the most hazardous. The promotional line is a special line that is made by users of Luckyb.it. Each week, a different submission is chosen to be put on the promotional line, and the winner receives a 0.1 Bitcoin prize. Luckyb.it has had no problems with trust, even since the beginning. The casino is provably fair based on the blockchain. Financials are one big portion of the puzzle that attract new players to pay. The full bankroll size is not known, but with many confirmed payouts and a high maximum profit it is safe to assume that they are adequately funded. With maximum bets as big as 25 BTC on some lines, and the minimum bet being only 0.001, Luckyb.it welcomes both casual gamblers and high rollers. The odds on Luckyb.it are set to have a house edge of 1.76%, which is unfortunately quite high for a Bitcoin casino. The game is original and can be a lot of fun to play, but most players have began to steer away from blockchain-based games due to network fees and speed. The chat is often filled with non-English speakers and the design isn’t super attractive. Overall, it is a great casino, but there is certainly room for improvement. Luckyb.it is a great casino no matter what kind of gambler you are. LuckyBit does not currently offer any Bitcoin bonuses to its players!